Re-evaluate Plant Vogtle, especially its water use, and move to efficiency, wind, and solar power instead, said Courtney Hanson of Georgia Women’s Action for New Directions (GA WAND) at the Georgia Public Service Commission meeting Tuesday 18 June 2013. I want to add my voice to the chorus of folks here who are concerned about water issues. We know that Vogtle 3 and 4 will require an additional withdrawal of as much as 74 million gallons a day from the Savannah River and most of that water will not be returned. We know that the central Savannah River area where Vogtle is located is already very prone to droughts and the plant has been close to shutting down several times due to drought conditions. Georgia is also already struggling to supply enough water for our homes, businesses, industries, and farms. This entry was posted in Coal, Economy, energy conservation, energy efficiency, GA PSC, Georgia, Georgia Power, Germany, Government, Natural gas, Nuclear, Pollution, Renewable Energy, Solar, Water and tagged 18 June 2013, 244 Washington Street SW, 30334-9052, Administrative Session, Atlanta, Bubba McDonald (4: west Georgia), Chairman Chuck Eaton (3: metro Atlanta), Coal, Doug Everrett (1: south Georgia), Economy, energy conservation, energy efficiency, GA, GA PSC, GA Public Service Commission, GA WAND, Georgia, Georgia Power, Georgia Power proposed closing of coal plants, Georgia Women's Action for New Directions, Germany, Government, John S. Quarterman, LAKE, Lowndes Area Knowledge Exchange, natural gas, Nuclear, Plant Vogtle, Pollution, Renewable Energy, Savannah River, Solar, Stan Wise (5 north Georgia), Tim Echols (2: east Georgia), Water on July 7, 2013 by John S. Quarterman. A German national residing in Georgia asked for a serious effort on energy efficiency and conservation while switching to real renewable energy sources instead of fossil fuels and nuclear, at the Georgia Public Service Commission meeting Tuesday 18 June 2013. She said increasing fires and floods were part of climate change, and we need to do something about it. I always hear this phrase “growing energy demand” as if it’s something, some matter of fact. A growing economy means growing energy demand, and that means consequently growing waste, growing pollution, growing inequity, and so on. Any thinking person should notice that we need to find a way out. For anyone concerned about our future, business as usual is no longer acceptable. We need drastic changes in our energy supply. We need to use less. To us, growing the economy is how we’re going to make profit. This entry was posted in Climate change, Coal, Economy, energy conservation, energy efficiency, GA PSC, Georgia, Georgia Power, Germany, Government, Natural gas, Nuclear, Renewable Energy, Solar, Wind and tagged 18 June 2013, 244 Washington Street SW, 30334-9052, Administrative Session, Atlanta, Bubba McDonald (4: west Georgia), Chairman Chuck Eaton (3: metro Atlanta), Climate change, Coal, Doug Everrett (1: south Georgia), Economy, energy conservation, energy efficiency, extractive energy, fire, fission, flood, fossil, GA, GA PSC, GA Public Service Commission, Georgia, Georgia Power, Georgia Power proposed closing of coal plants, Germany, Government, John S. Quarterman, LAKE, Lowndes Area Knowledge Exchange, monopoly, natural gas, Nuclear, nuclear waste, Renewable Energy, Solar, Stan Wise (5 north Georgia), Tim Echols (2: east Georgia), Wind on July 7, 2013 by John S. Quarterman. Glenn Carroll of Nuclear Watch South asked GA PSC to raise the 2 MW solar cap and to get Georgia Power to build solar in Georgia rather than in distant states, plus efficiency and conservation, at the Georgia Public Service Commission meeting Tuesday 18 June 2013. She said they’d gotten a lot of national attention on Plant Vogtle, which was having a legendary bad year, in procurement, costs, etc. She praised Sierra Club, Georgia Watch, and Southern Alliance for Clean Energy (SACE) for intervening in Georgia Power’s IRP. The world has changed really really fast and Georgia Power is being isolated. It is protected financially of course because of the small business and residential customers that are covering all of the risks that they are taking. We want solar power here, not Arizona and New Mexico. She recommended conservation and efficiency programs at Port Angeles, presumably the one in Washington State. This entry was posted in Coal, Economy, energy conservation, energy efficiency, GA PSC, Georgia, Georgia Power, Government, Natural gas, Nuclear, Solar and tagged 18 June 2013, 244 Washington Street SW, 30334-9052, Administrative Session, Atlanta, Bubba McDonald (4: west Georgia), Chairman Chuck Eaton (3: metro Atlanta), Coal, Doug Everrett (1: south Georgia), Economy, energy conservation, energy efficiency, GA, GA PSC, GA Public Service Commission, Georgia, Georgia Power, Georgia Power proposed closing of coal plants, Glen Carroll, Government, John S. Quarterman, LAKE, Lowndes Area Knowledge Exchange, natural gas, Nuclear, Nuclear Watch South, Port Angeles, Solar, Stan Wise (5 north Georgia), Tim Echols (2: east Georgia) on July 7, 2013 by John S. Quarterman. Paul[?] Matthews said he’s been green since before it was cool, first in an earlier Georgia Power program (EarthCraft), and now in EarthCents. He thinks the program is good, with both environmental and economic benefits, but he asked for it to be extended to become a model for the south, at the Georgia Public Service Commission meeting Tuesday 18 June 2013. He spoke about his company’s investment in sustainable efficiency and conservation, and asked GA PSC and Georgia Power to also do more. A much more efficient way and cost-effective of reducing power is by reducing energy used. We’re not only looking at tripling the savings over the next ten years, but we’re also looking at job growth…. …a sustainable and long-term growth approach. Let’s make the rebates and also the tax credits so they’re a model for Georgia and also for the south. This entry was posted in Coal, Economy, energy conservation, energy efficiency, GA PSC, Georgia, Georgia Power, Government, Natural gas, Nuclear, Solar and tagged 18 June 2013, 244 Washington Street SW, 30334-9052, Administrative Session, Atlanta, Bubba McDonald (4: west Georgia), Chairman Chuck Eaton (3: metro Atlanta), Coal, demand side, Doug Everrett (1: south Georgia), EarthCents, Economy, energy conservation, energy efficiency, GA, GA PSC, GA Public Service Commission, Georgia, Georgia Power, Georgia Power proposed closing of coal plants, Government, jobs, John S. Quarterman, LAKE, Lowndes Area Knowledge Exchange, model, natural gas, Nuclear, savings, Solar, Stan Wise (5 north Georgia), sustainable, Tim Echols (2: east Georgia) on July 7, 2013 by John S. Quarterman. A contractor who does homeowner education as part of Georgia Power’s Earth Cents program praised that program at the Georgia Public Service Commission meeting Tuesday 18 June 2013. And this Earth Cents program has, in my experience, taken a lot of that mystery away. The homeowners that I touch and I deal with come away with an understanding that leaves them less concerned about the rate hikes that I’m sure keep you guys up at night when it comes to a vote and more concerned about where the money is actually going. I’m guessing he means homeowners are more concerned about what Georgia Power is using to generate the power. Introduced in 2008, EarthCents energy efficiency programs help our customers save energy and money while reducing greenhouse gases. EarthCents comprises a set of standing and new programs—and educational efforts—to reduce residential and commercial electricity consumption. This entry was posted in Coal, Economy, Education, energy conservation, energy efficiency, GA PSC, Georgia, Georgia Power, Government, Natural gas, Nuclear, Solar and tagged 18 June 2013, 244 Washington Street SW, 30334-9052, Administrative Session, Atlanta, Bubba McDonald (4: west Georgia), Chairman Chuck Eaton (3: metro Atlanta), Coal, Doug Everrett (1: south Georgia), EarthCents, Economy, Education, energy conservation, energy efficiency, GA, GA PSC, GA Public Service Commission, Georgia, Georgia Power, Georgia Power proposed closing of coal plants, Government, John S. Quarterman, LAKE, Lowndes Area Knowledge Exchange, natural gas, Nuclear, Solar, Southern Company, Stan Wise (5 north Georgia), Tim Echols (2: east Georgia) on July 7, 2013 by John S. Quarterman. Jill Stuckey spoke for wind power for economic development on behalf of the College of Engineering and Information Technologies at Georgia Southern University. She said with its experience in solar and wind Georgia Southern is willing, able, and ready to help at the Georgia Public Service Commission meeting Tuesday 18 June 2013. Video by John S. Quarterman for Lowndes Area Knowledge Exchange (LAKE), 244 Washington Street SW, Atlanta, GA, 30334-9052, 18 June 2013. This entry was posted in Coal, Economy, energy conservation, energy efficiency, Environment, GA PSC, Georgia, Georgia Power, Government, Internet access speed, LAKE, Solar, Wind and tagged 18 June 2013, 244 Washington Street SW, 30334-9052, Administrative Session, Atlanta, Bubba McDonald (4: west Georgia), Chairman Chuck Eaton (3: metro Atlanta), Coal, Doug Everrett (1: south Georgia), Economy, energy conservation, energy efficiency, Environment, GA, GA PSC, GA Public Service Commission, Georgia, Georgia Power, Georgia Power proposed closing of coal plants, Georgia Southern University, Government, Internet access speed, John S. Quarterman, LAKE, Lowndes Area Knowledge Exchange, natural gas, Nuclear, Solar, Stan Wise (5 north Georgia), Tim Echols (2: east Georgia), Water, Wind on June 29, 2013 by John S. Quarterman. The disruptive challenge electric utilities face is like telephone companies faced years ago, as Edison Electric Institute recently pointed out. Circuit switching 20 years ago is like distributed solar power and the smart grid it needs now; this is what I described at the Georgia Public Service Commission meeting Tuesday 18 June 2013. Hi, I’m John Quarterman, I’m from Lowndes County, down near the Florida line. These videos I’ve been taking are with Lowndes Area Knowledge Exchange and you’ll find them on YouTube later. This entry was posted in Coal, Economy, energy conservation, energy efficiency, Environment, GA PSC, Georgia, Georgia Power, Government, Internet access speed, LAKE, Natural gas, Nuclear, Solar, Water, Wind and tagged 18 June 2013, 244 Washington Street SW, 30334-9052, Administrative Session, aquifer, Atlanta, baseload, Bubba McDonald (4: west Georgia), business model, capacity, Chairman Chuck Eaton (3: metro Atlanta), circuit switching, Coal, dependable, distributed solar power, Doug Everrett (1: south Georgia), Economy, Edison Electric Institute, energy conservation, energy efficiency, Environment, Federal Energy Regulatory Commission, FERC, GA, GA PSC, GA Public Service Commission, Georgia, Georgia Power, Georgia Power proposed closing of coal plants, Government, Internet access speed, John S. Quarterman, Jon Wellinghoff, LAKE, landline, Lowndes Area Knowledge Exchange, Lowndes County, natural gas, Nuclear, packet switching, Plant Hatch, Plant Vogtle, reliable, smart grid, Solar, south Georgia, Stan Wise (5 north Georgia), sustainable, Tim Echols (2: east Georgia), Valdosta, Water, Wind on June 29, 2013 by John S. Quarterman. Garry Gentry read the WWALS Watershed Coalition letter at the Georgia Public Service Commission meeting Tuesday 18 June 2013. The recent rains have swollen our blackwater rivers, Withlacoochee, Willacoochee, Alapaha, and Little, under our longleaf pines and Spanish-moss-covered oaks, and filled up the tea-colored tannin waters in our frog-singing pocosin cypress swamps here in central South Georgia. But that was only a dent in our protracted drought that ranges from mild to extreme, with projections not much better…. There is no need to use our Floridan Aquifer water to build more baseload power plants while Georgia lags behind Michigan, Massachusetts, and even tiny New Jersey and Maryland in solar power. 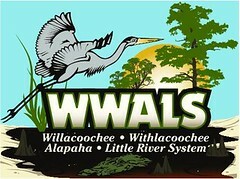 WWALS calls on the PSC to ask Georgia Power to conserve our water and to bring jobs to south Georgia through solar power and wind off the Georgia coast. 244 Washington Street SW, Atlanta, GA, 30334-9052, 18 June 2013. This entry was posted in Coal, Economy, energy conservation, energy efficiency, Environment, GA PSC, Georgia, Georgia Power, Government, Natural gas, Nuclear, Solar, Water, Wind and tagged 18 June 2013, 244 Washington Street SW, 30334-9052, Administrative Session, Alapaha, aquifer, Atlanta, baseload, Bubba McDonald (4: west Georgia), business model, capacity, Chairman Chuck Eaton (3: metro Atlanta), Coal, cypress, distributed solar power, Doug Everrett (1: south Georgia), Economy, Edison Electric Institute, energy conservation, energy efficiency, Environment, Federal Energy Regulatory Commission, FERC, Floridan Aquifer, GA, GA PSC, GA Public Service Commission, Georgia, Georgia Power, Georgia Power proposed closing of coal plants, geothermal, Government, John S. Quarterman, Jon Wellinghoff, LAKE, Little, longleaf, Lowndes Area Knowledge Exchange, natural gas, net zero, Nuclear, oak, picosin, Plant Hatch, Plant Vogtle, River, Solar, south Georgia, Stan Wise (5 north Georgia), swamp, Tim Echols (2: east Georgia), Water, Willacoochee, Wind, Withlacoochee, WWALS, WWALS Watershed Coalition on June 21, 2013 by John S. Quarterman. Someone made a very good case for the cost-effectivness of energy efficiency for saving money, health, and comfort, at the Georgia Public Service Commission meeting Tuesday 18 June 2013. He didn’t start by saying his name, and I had a camera battery replacement about that time, but most of his talk is here. This entry was posted in Coal, Economy, energy conservation, energy efficiency, GA PSC, Georgia, Georgia Power, Government, Natural gas, Nuclear, Solar and tagged 18 June 2013, 244 Washington Street SW, 30334-9052, Administrative Session, Atlanta, Bubba McDonald (4: west Georgia), Chairman Chuck Eaton (3: metro Atlanta), Coal, Doug Everrett (1: south Georgia), Economy, energy conservation, energy efficiency, GA, GA PSC, GA Public Service Commission, Georgia, Georgia Power, Georgia Power proposed closing of coal plants, geothermal, Government, John S. Quarterman, LAKE, Lake Sinclair, Lowndes Area Knowledge Exchange, natural gas, net zero, Nuclear, Plant Branch, Putnam County, Solar, Stan Wise (5 north Georgia), Tim Echols (2: east Georgia) on June 21, 2013 by John S. Quarterman. “I’d like to see Georgia Power… provide a geothermal and solar net zero energy concept for the project that could act as a demonstration project for them as well,” said someone unknown from Putnam County, at the Georgia Public Service Commission meeting Tuesday 18 June 2013. (This is why to always say your name when you speak.) Could have been Putnam County Commissioner Alan Foster. He also asked for a convention center, golf course, and lakefront activities area, and naturally at least one Public Service Commissioner latched onto the golf course. The speaker said his “vision” involved privatization. Seems to me the problem is the existing privatization of the GA PSC. This entry was posted in Coal, Economy, GA PSC, Georgia, Georgia Power, Government, Natural gas, Nuclear, Solar and tagged 18 June 2013, 244 Washington Street SW, 30334-9052, Administrative Session, Atlanta, Bubba McDonald (4: west Georgia), Chairman Chuck Eaton (3: metro Atlanta), Coal, Doug Everrett (1: south Georgia), Economy, GA, GA PSC, GA Public Service Commission, Georgia, Georgia Power, Georgia Power proposed closing of coal plants, geothermal, Government, John S. Quarterman, LAKE, Lake Sinclair, Lowndes Area Knowledge Exchange, natural gas, net zero, Nuclear, Plant Branch, Putnam County, Solar, Stan Wise (5 north Georgia), Tim Echols (2: east Georgia) on June 21, 2013 by John S. Quarterman.